Water pollution is one of the most serious threats our environment faces today, and its impact affects wildlife, natural habitats and even human beings. While preventing water pollution may feel overwhelming, there are many things that regular folks can do each day to reduce it. Stormwater easily flows across materials like asphalt and concrete into storm drains, carrying with it all the debris and contaminants it picks up. Instead of using hard materials, prevent these pollution streams from running cross your property by using paver stones, wood, gravel or other porous materials. Some hard surfaces can’t be avoided, like driveways, but you can still limit pollution streams by trenching the border or laying down gravel or plants to stop contaminant-filled runoff before it reaches storm drains. Keep a small wastebasket in your bathroom to prevent tossing non-degradable products down the toilet. When flushed, products like tampon applicators or baby wipes end up disrupting the sewage treatment process and contaminating water and beaches. Old pills flushed down the toilet also contribute to water pollution, so take them to your local pharmacy for proper disposal. Like your toilet, your sink is not the proper place to dispose of many household products. Don’t let used oil, chemical products or pain down the drain. Many of these products contain ammonia, sodium hypochlorite, formaldehyde and other toxic ingredients that cause havoc on our water supply. You local public works, sanitation or environmental department can suggest the best ways to dispose of these products safely in your community. Uncollected animal waste causes a big issue for water quality because it contains nutrients and pathogens that decompose and lead to the growth of weeds and algae. 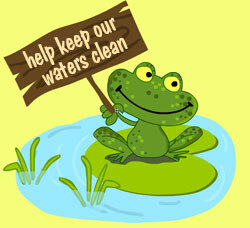 This makes water unusable for fishing, boating, swimming and drinking. The simplest way to avoid this problem is to pick up after your furry friend every time and dispose of waste properly in trash bags or disposal boxes. Regularly maintaining your car can prevent antifreeze, coolant and oil from dripping onto your driveway and seeping into supplies of groundwater. Additionally, skip an at-home wash in favor of a professional car wash. These facilities are required by law drain used water into sewer systems that treat it before toxins and contaminants reach our water supply. Not littering is environmental awareness 101, but it’s easy to let it slide a bit when a trashcan isn’t nearby. Keep a small bag in your purse, car or pocket to carry waste to prevent it from ending up contaminating waterways and beaches. Even better, pick up litter whenever you see it and dispose of it properly. This simple act can make a powerful difference in combating water pollution.